Most of you probably don't know this, but my very first real job in my early teens was at a greenhouse, and I worked there on and off for almost 20 years (sometimes just going in to help out one or two days a year at my old boss's request - Mother's Day and Victoria Day which are the busiest days of the year). 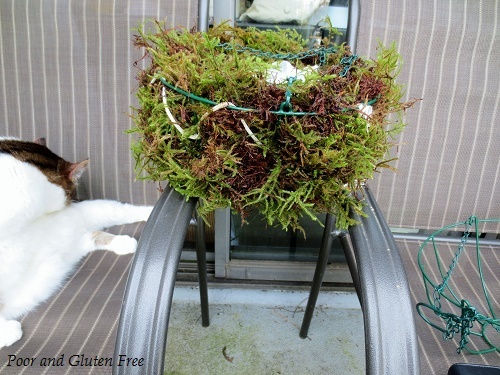 And over those years, depending on the season, I made moss baskets. Hundreds of moss baskets. Likely even thousands. So this week's post is not a recipe, but an easy picture tutorial. 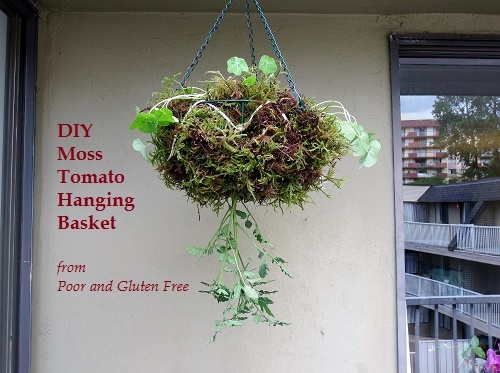 I can't say that I ever made hanging tomato baskets at the greenhouse, but I do know how to make moss baskets, and this year I decided to try my hand at hanging tomatoes. I could have gotten one of those hanging tomato planter thingies, but frankly they're ugly, and at $10 a pop (without soil) I knew I could do it for cheaper. 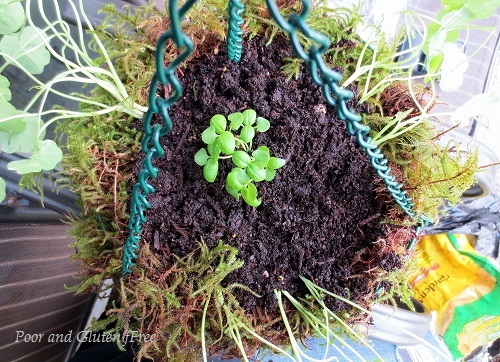 Here's how I planted my hanging tomato baskets. If you're doing this on a deck, lay out some plastic or newspaper underneath the basket to collect dirt, etc. 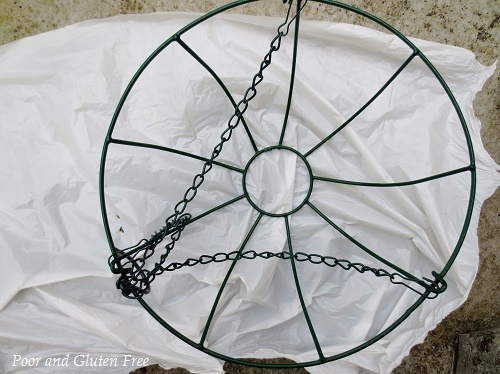 Line the bottom of the basket with the plastic bag or the plant water tray, so that it comes up the inside just a couple of inches - not all the way to the top. Cut a hole in the plastic large enough to fit the root ball of your bag or tray. 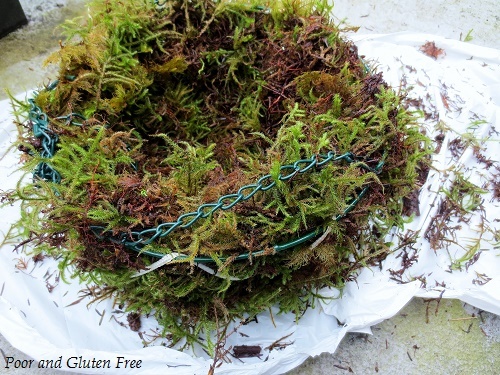 If you're making a regular moss basket (no tomatoes on the bottom) you won't need to do this, just put in the bag. 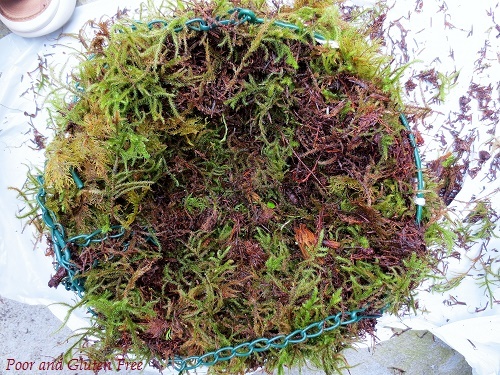 This helps to retain water, as moss baskets notoriously dry out quickly! 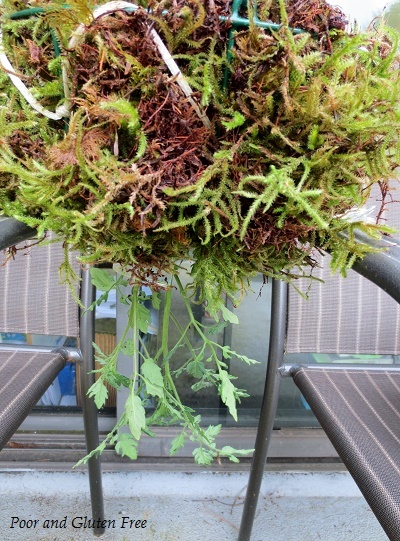 Wrap the sandwich bag around your tomato's root ball and push it up through the bottom of the moss and the plastic bag / tray. 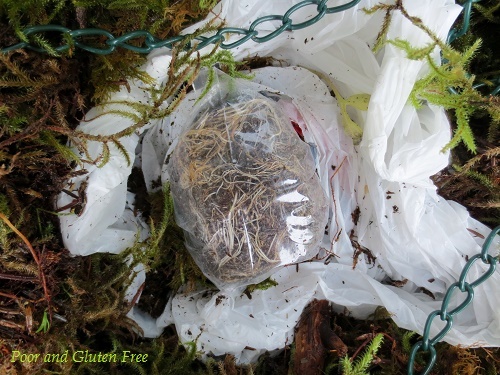 Remove the sandwich bag and tuck the plastic bag and moss back around the tomato stem. You'll want the bag tucked loosely around the stem to allow the stem room to grow, but tight enough that it will still retain some water. 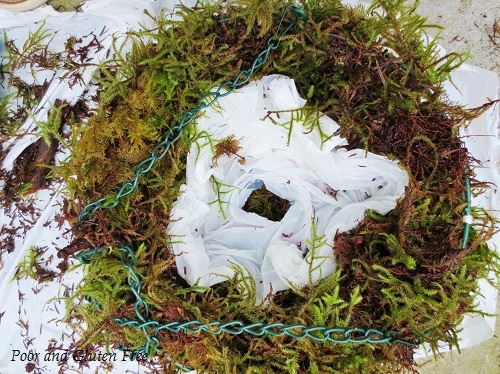 Tuck the moss around as best you can underneath the bag to help keep in the soil and water as well. Fill in soil around the tomato. I added three little nasturtiums and a basil on the top. Mostly for colour (nasturtiums to attract bees) and companion planting (basil is supposed to be good for tomatoes, so let's give it a go! 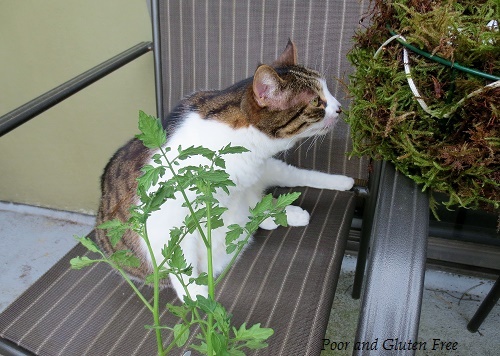 ), but also to help shade the top of the basket to retain moisture during hot summer days. And there you have it! I hung them under the cover of my deck, so they're shielded from the wind, but get a bit of rain and a lot of sun. It's been about 2 weeks now, and my tomatoes are going strong. They've started to grow upwards, but also outwards, and already have a couple of flowers on them. We even had a wind storm the other night, and they survived just fine. So with a little luck and a lot of water, I'm hoping that in a few weeks' time I'll be posting recipes for salads using my own homegrown tomatoes and basil. 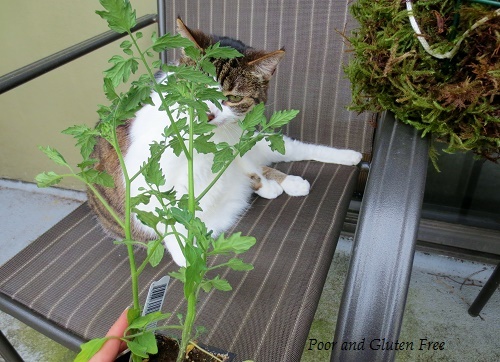 Have you tried planting hanging tomatoes? What are your favourite basket stuffers? Have you seen my book Living with Oral Allergy Syndrome: A Gluten and Meat-Free Cookbook Wheat, Soy, Nut, Fresh Fruit and Vegetable Allergies? You can order it where most books are sold, or order from Amazon.com here !